We've just come back from a weekend at Drayton Manor. 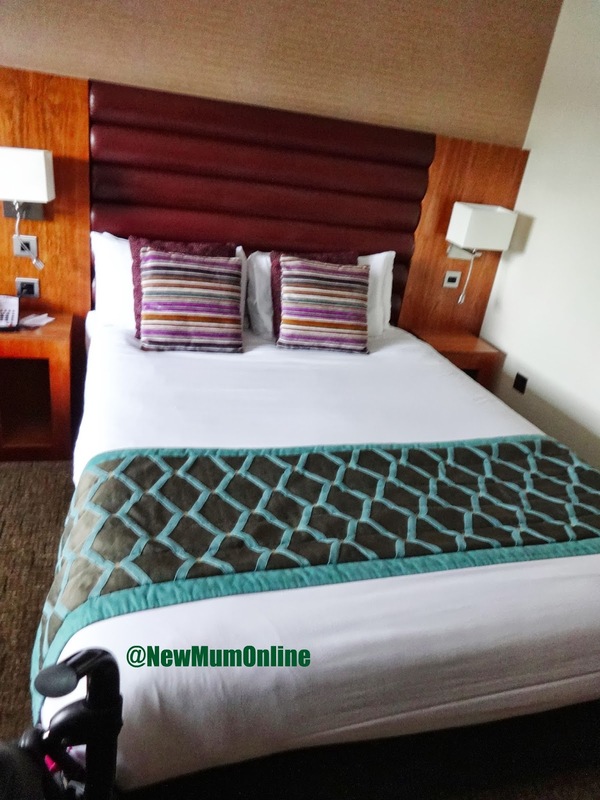 We stayed Saturday night (15th June) at Drayton Manor Hotel. 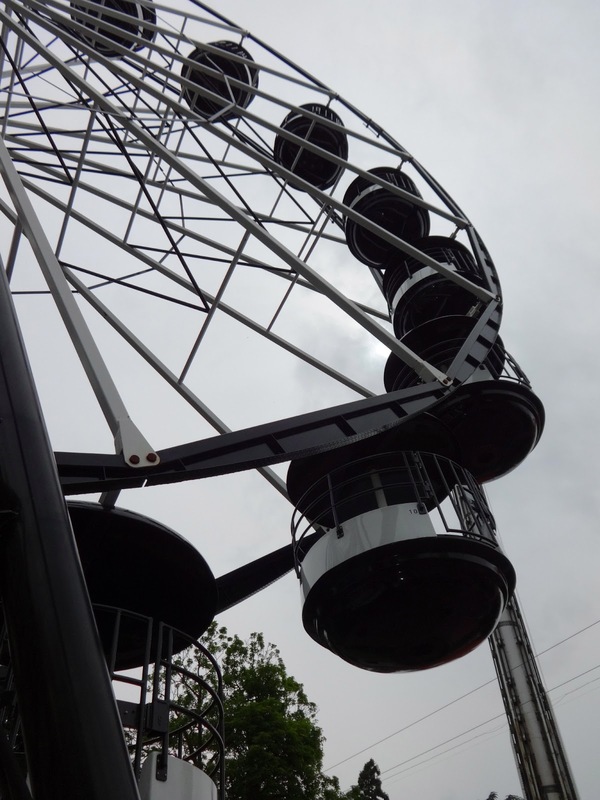 We had to decide whether to drive up Saturday late afternoon, have dinner and the night there, then theme park or, travel early and have two full action-packed theme-park days. Wouldn't be our natural choice but our special boy Aaron was 3 years old on Saturday and LOVES Thomas and Thomas Land. So we chose the latter. 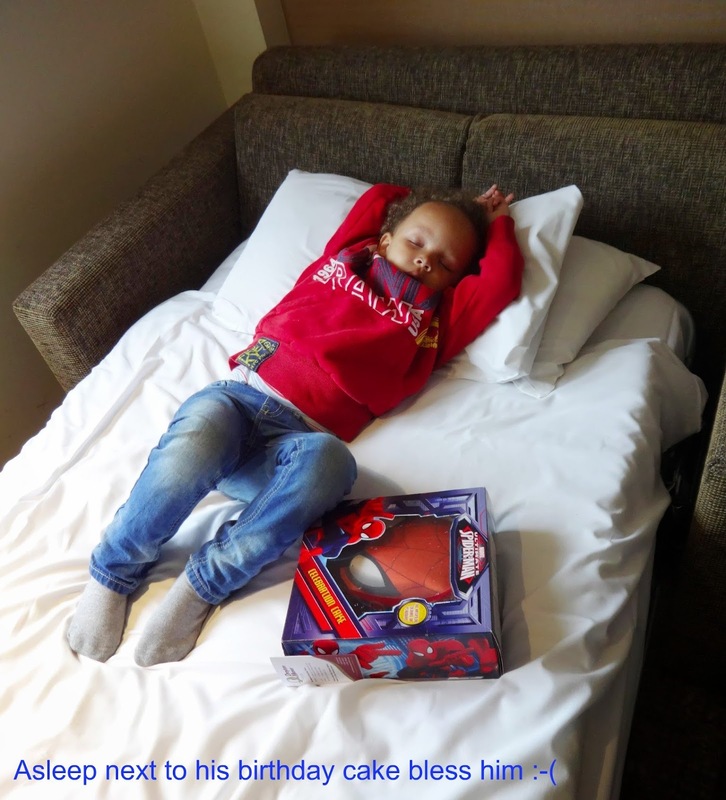 In fact, this was our 3rd visit to Thomas Land; our 2nd time staying at the hotel. On arrival on Drayton Manor grounds, we could not find a space in the Drayton Manor Hotel carpark and did not realise the ones that say Tower Suite and Hamilton Suite were also places we could park, so we actually drove to the theme park car parks in the end and did not check-in until after a day at Thomas Land. Our luggage remained in the car all day, which wasn't a problem. When we did later check-in, we were pleased. Our room was airy and spotless. 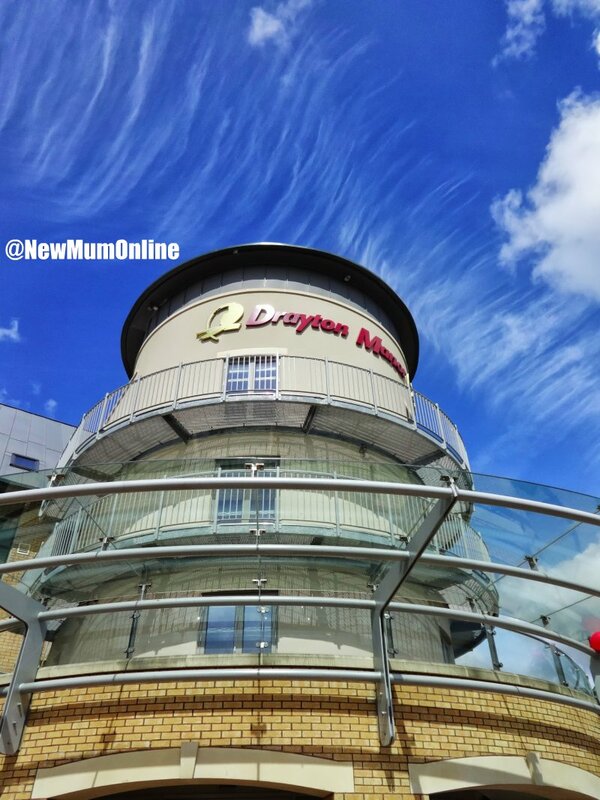 The thing that strikes you about Drayton Manor Hotel on arrival, and also the thing that leaves a lasting impression is how beautifully landscaped it is. 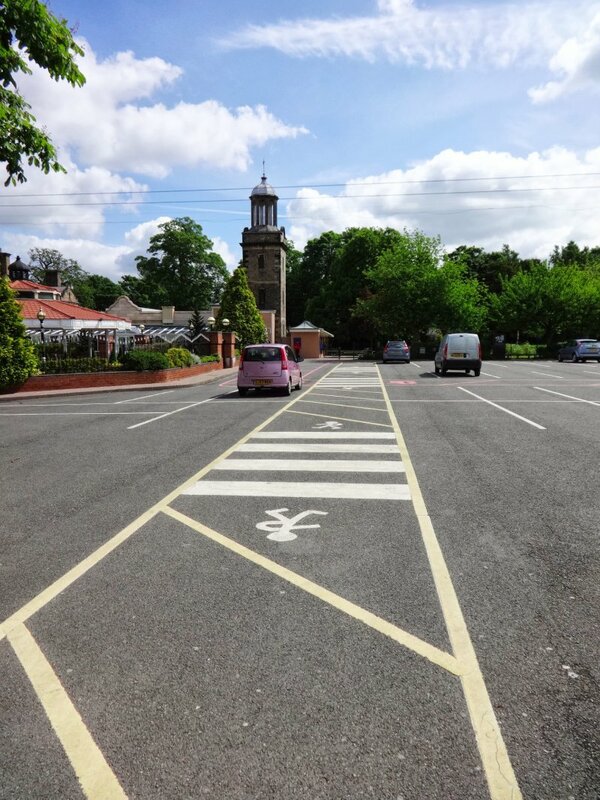 I think years ago I would have taken this for granted and it would have 100% gone over my head, but as a Mum who sometimes gets stressed and runs that very same 100% on adrenaline, the landscaping had an "ahhhh" effect on me, which tangibly lowered my blood pressure and had me breathing more deeply - no exaggeration! Aaron fell asleep REALLY early, and with hindsight, THAT was my chance to go and "chill" and walk around the grounds... missed opportunity right there. 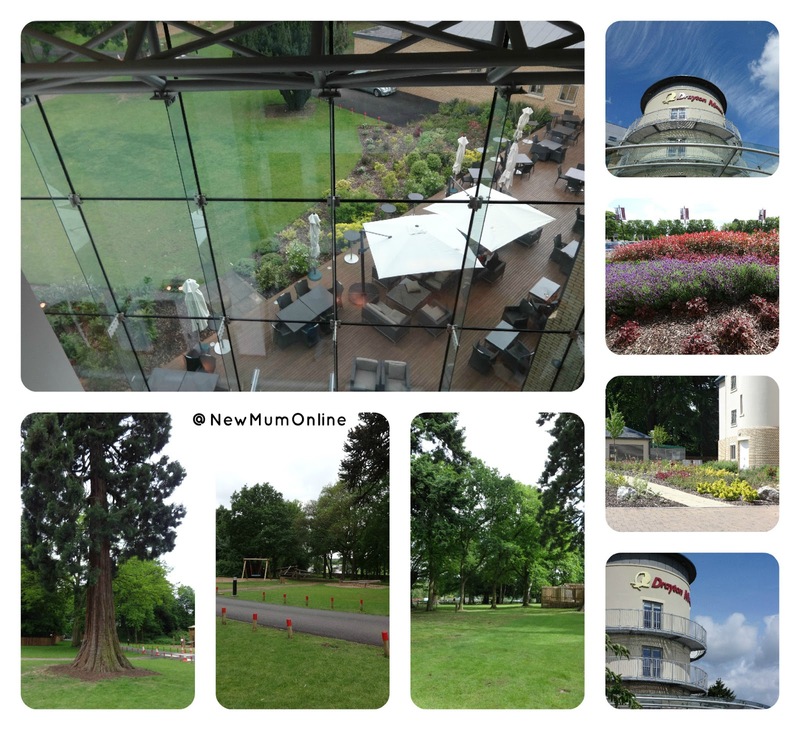 If you like the above photos and would like to seem them full size, go to my Google Plus Drayton Manor Hotel photo album. 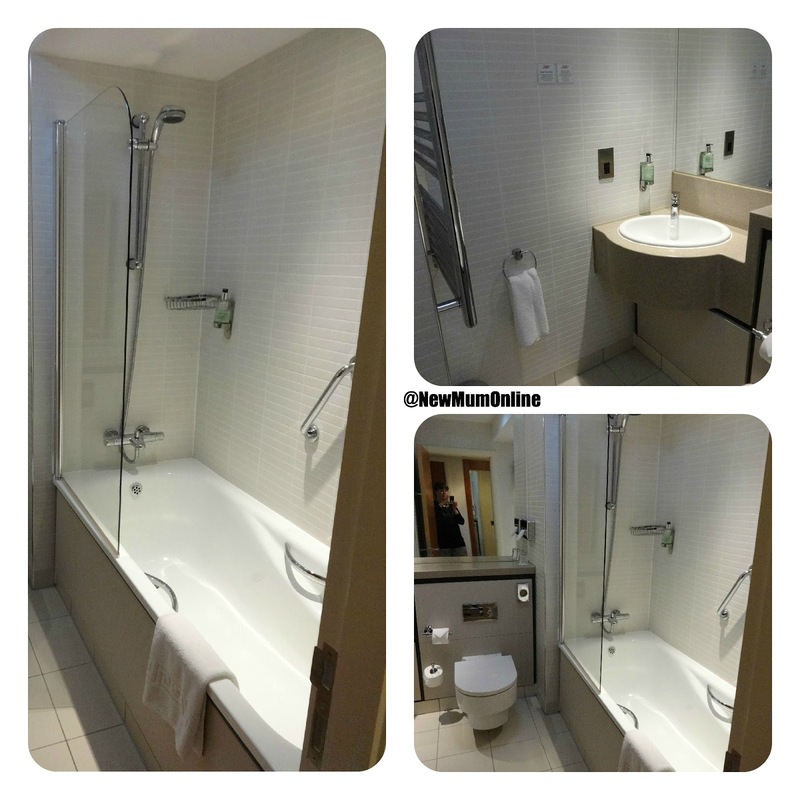 Please read right through to the end of this post, for my "pros and cons" of the hotel. The reception area feels slightly like a conference hotel, but is softened by the character people, the carousel, and the Thomas Land hotel shop. I love the "character people", who help to stop the hotel from feeling too corporate. Aaron went and talked to them all with Daddy. All of the above give little ones something to do, if there is a queue to check in or check out. I can't comment on our dinner Saturday night, in the restaurant sense. Aaron was very poorly and so he fell asleep early. We took the option to order room service, which the hubby later confided he preferred anyway, as he was worried about Aaron misbehaving through dinner. Bless Aaron. 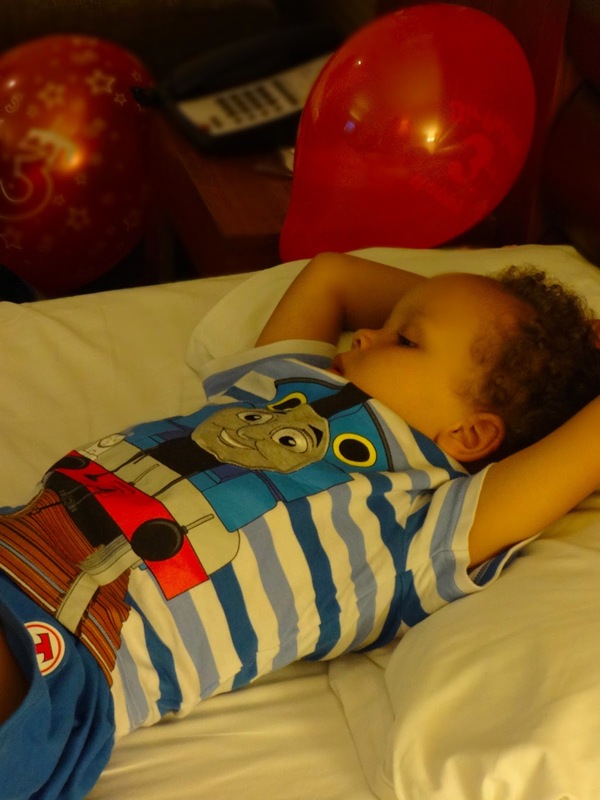 After a busy birthday in Thomas Land he fell asleep on the sofa bed. It was really convenient for us as it was already pulled out AND the bed was made! It was while he was asleep as above, that I should have treated myself to a walk of the grounds. The room off the restaurant that leads to the room used for the Character Breakfast! The Character Breakfast - yes that is The Fat Controller sat right there in the middle! Aaron played with trains for most of the time that we were at breakfast - there's 3 play tables dotted around the restaurant, but be warned, DO bring a train as they are not provided and the last time we came (October) there were SO many tears from Aaron (and I was tweeting about it) that they had to OPEN the shop at 2100 to get him one! You need a wooden style Thomas train, that fits wooden tracks, as the die cast ones will not fit. He did spend some time at the breakfast table with me - it wasn't all at train tables as above. He even ate a whole plate of scrambled egg, despite being ill all night. I was happy as that meant he was set and energised for day 2 in the theme park. We sat there till Daddy came down at 9!!! (he promised he'd be down at 08:40) and we even stayed with Daddy till 09:30. I then sent the two of them out to the gorgeous hotel garden so I could go upstairs and tidy the room. Daddy said "pack don't tidy" but for me you cannot do one without having done the other and the room was trashed a mess, despite us staying only one night. Despite being up there from 09:30 to 10:00 we still didn't check out until nearly 10:30. They didn't tell us off, which surprised me, as check-out is a strict 10:00 (which also surprised me given it was a Sunday). Every hotel I have ever stayed in does 12:00 check-out at weekends. Ah well. You start to see attractions as you walk along which builds up the excitement! 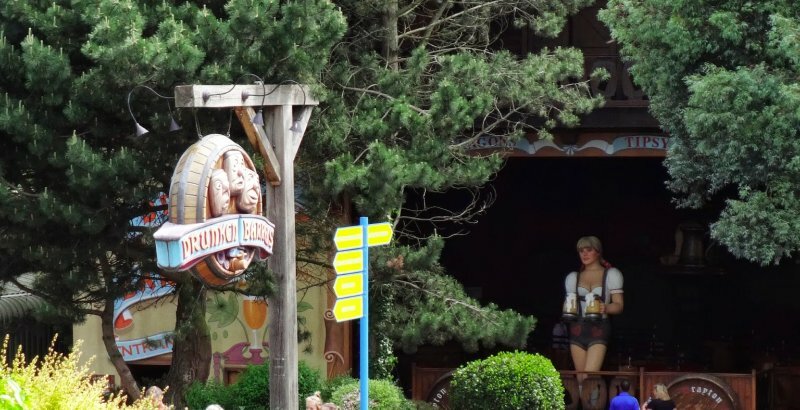 Drunken Barrels (below) is the first ride you come to but it's very average... we did not do that Saturday or Sunday as we experienced it in October. I don't want to make this review grim, but basically when he woke up, from that sleep I show you above, he vomited. I somehow could tell it was coming, and got him to the bathroom, so all the bed linen was saved. All day he'd been too excited to eat, so all he brought up was his bottle of ribena and some of Daddy's crisps that he'd eaten. So, it was NOT anything he'd eaten whilst there if you get what I mean. He then came into our bed, (I had the opportunity to get his PJs on - Thomas ones OF COURSE) and to cut a long story short, it happened a few more times. These times the bed linen was NOT saved, so I had to make many calls to reception. Their patience, understanding and help was way beyond the call of duty even taking soiled ones away (which I'd dumped in the bath) so as not to smell out the room. It came across as really considerate, but maybe they were also thinking of not having a smell linger for the next guests. The beds had waterproof mattress protectors on, so I needn't worry about soiled mattresses. I said to the hubby that it was actually a good thing it happened there and not at home, as at least it wasn't adding to our laundry pile and we could focus on Aaron and not on worrying that we were running out of changes of bed clothes. Each time he woke he insisted on drinks, as he was dehydrated but they each in turn came up (ribena as above, then 3 oz of a bottle, then orange juice). I went and got a bottle of water from reception and he woke me every half hour for the whole night having a sip each time, till morning when the whole bottle was gone. He kept the water down, and thanks to its recovery properties WAS able to spend a day in Thomas Land the next day. Thank God I brought 3 pairs of PJs (two of them Thomas) as we did need the two Thomas ones! In our bed before later going back into the sofa bed. Oh what a night! This gave us chance to walk back from the tea shop near Spencer's Adventure Playground, to the main park and have a wander before he woke up. Our room was way way nicer than the one we had in October (which was two singles) - this time we had a proper double room AND a sofa bed for Aaron. Evening kids entertainment was available from 1700 to 1900. Character Breakfast (we did not try it). 15 Thomas Themed bedrooms (we did not book one). The Manager of the front desk was on duty Saturday night AND Sunday morning (she finished at 10 p.m. and started at 7 a.m.) so she was available for all of my queries etc... very professional. She was the one bringing me fresh bed linen (until the last occasion after she'd clocked off) and gave me the complimentary bottle of water that kept Aaron hydrated throughout the night (which he DID keep down). They don't seem to be consistent with giving the Thomas welcome pack - we did not receive one. Check in does feel like checking in for a flight, with a script that they roll off similar to "have you packed your own bag". It needs to be a bit more theme parkie, but I guess I am particularly fussy about this, having experienced Butlins. There probably wasn't time for them to say much more to be fair, given that I had Aaron in the buggy who was impatient and a queue of people behind me, same. The checkout of 10 a.m. is really wrong in my opinion. 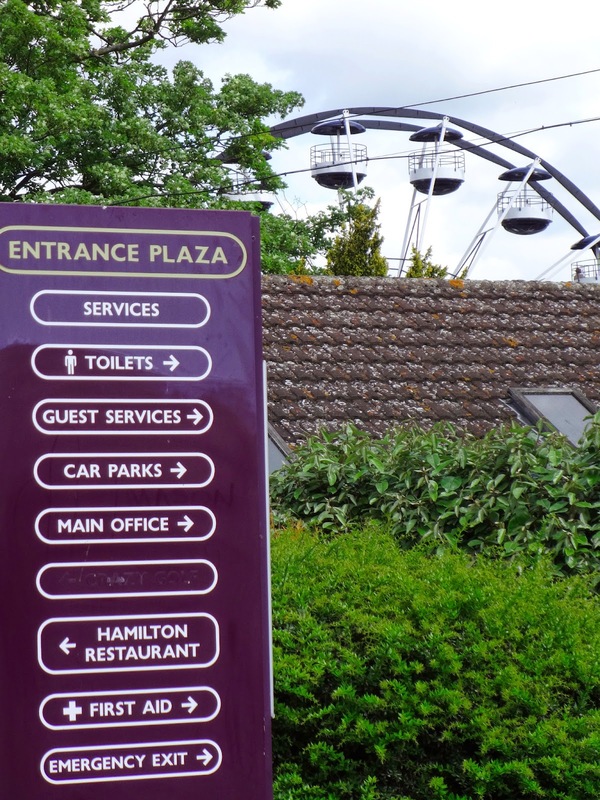 I would like a lie-in, leisurely breakfast and the option of checking out by 12, although with a theme park to head off to, maybe that's NOT such a good idea actually. For a limited time only, upgrade to a Thomas & Friends themed room for just £50! (Sundays to Thursdays). I am linking this post to Mama Buzz's Inspire me Wednesday. Nice. Thanks for taking the time.I enjoy your blog. My thanks for posting this.The information is so wonderful, I am interested in it. 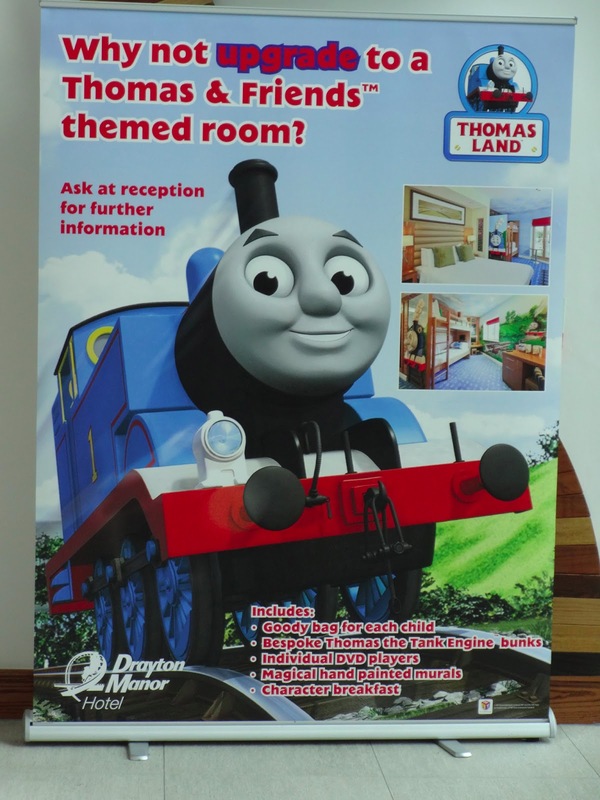 You only receive a Thomas welcome pack if you book to stay in a Thomas room. Well then I would suggest that gets reviewed given that there are only 15 Thomas rooms and breakfast was FULL of parents and little ones. It would be a nice touch for every little one to receive on arrival. Thank you so much for sharing on Inspire Me Wednesday. I'm so sorry your Aaron got sick.... that's no fun! Thomas Land sounds like something my 5 year old would absolutely love. He loves his trains.